With today’s economic slow down who can afford to drop a grand on a pair of shoes? 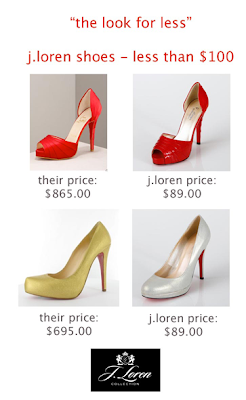 Why buy Louboutin when J.Loren shoes offer the same great look at a fraction of the price. With new, trendy styles for every season, J.Loren shoes are essential to complete any outfit, whether its a day at the office or a night out with the girls. J. Loren is a family-owned shoe design and manufacturing company that has presented the latest in casual, evening, and dyeable shoes and handbags for thirty years. The brand employs high-quality satin, dyeable fabric, leather soles, and hand-placed Swarovski stones for a collection of over two hundred styles. J. Loren shoes, handbags and dyeables can be found in boutiques and department stores all over the world, including the United States, Canada, Mexico, the Caribbean, Israel, Australia and London.